Free printable pages! 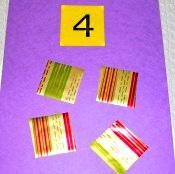 Hands on activities to introduce counting, simple addition and subtraction. Great to improve fine motor skills too. Free printable pages for simple adding and subtracting activities. Perfect for the hands on learner beginning to add. 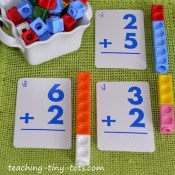 Use lego pieces to visually show addition and subtraction. 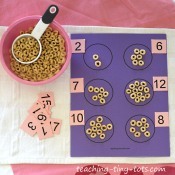 Fun with Cheerios...cute inexpensive way to introduce number concepts. How much is two, three and four! For older kids, try simple addition. Free Printable page! Snap Cube Activities! Great tool to explore addition, counting and patterns. Free Printable page! 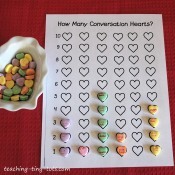 Simple matching, counting and graphing activity using conversation heart candy. 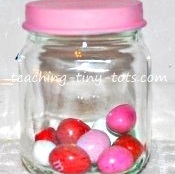 Great classroom activity in small groups or at home with your child. Free Printable pages for matching and graphing. Simple addition problems using stickers with a Fall theme! Very Cute and could be adapted to different themes or holidays. 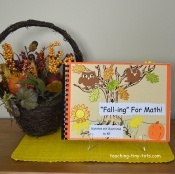 This is a wonderful class book that Kindergartners will enjoy making. A simple activity but one every child will enjoy. Reinforce Sorting and Counting. Or even set up candies in a patterns to be packaged! Using felt, material, foam and even wrapping paper to make these colorful number pages to be hung or made into a book. 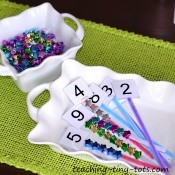 Free printable number page to help you start. 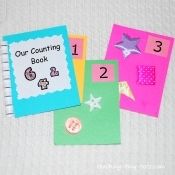 Make a touch and feel counting book to help reinforce number identification as well as number concepts. 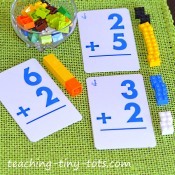 Great for introducing number sense and fun too. Perfect for home, preschool and kindergarten classrooms. Change the object to make it interesting. A green craft as well. 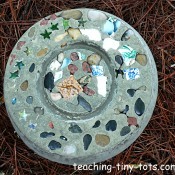 Make these stepping stones and have fun with stepping stone counting games. Introduce listening skills while playing as well.